This new glamping experience is on a working farm in the foothills of Mount Domett in the Waitaki Valley, with sweeping bucolic views. 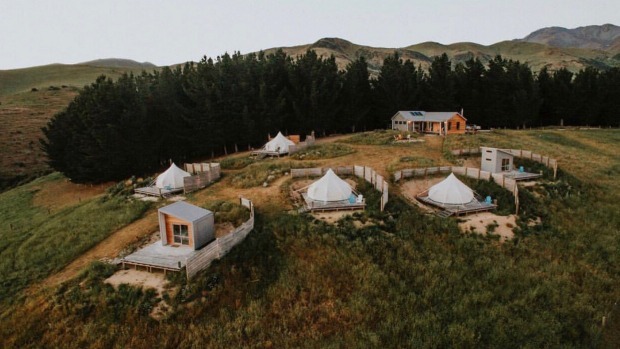 This new glamping experience is on a working farm in the foothills of Mount Domett in the Waitaki Valley, with sweeping bucolic views. The farm is a short drive from Kurow in North Otago and about 2.5 hours from Dunedin Airport, or 3.5 hours from Christchurch Airport. Patrick and Amber Tyrell have created something truly magical on their 40-hectare holistic beef farm in the spectacular Waitaki Valley. Amber, who grew up on a neighbouring farm, and Patrick, who grew up on a farm in South Africa, wanted to recreate an African safari tent experience with a Kiwi twist. There are four Lotus Belle Tents on the property, two cosy cabins, a main eco lodge with bathroom facilities, self-catering kitchen, dining space and large wood fire. Most recently, the Tyrrells added four rustic alfresco baths for soaks in the pine forest. Two geodesic dome tents will open in May, with timber flooring, small wood fires and clear plastic fronts so you can lie back and soak up the views from your bed. The glamping tents come with every conceivable luxury. Accommodation is either in the luxurious glamping tents or standalone two-storey timber cabins, which come with their own mini log fires. We stayed in a tent, which is typically set up with a king-size bed. I was travelling with a friend so our tent's configuration was twin king single beds and a trundle bed for my nine-year-old daughter. Even with three beds, the stylish tent felt spacious. 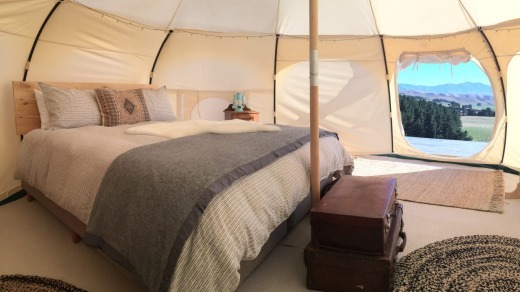 The glamping tents come with every conceivable luxury: quality linen, feather quilts, plump pillows, pure wool blankets, solar fairy lights, soft rugs underfoot and even mobile phone chargers. There is also a discreet portable toilet so you don't need to trudge up to the main lodge at night. All tents are built on raised wooden platforms and have spacious decks with Cape Cod chairs. Pull back the tent flap for mesmerising views of rolling green pasture and grazing belted Galloways. Valley Views has a fully equipped kitchen for self-catering in the communal lodge, and barbecue, but the Tyrrells' cooking is so good, I wouldn't bother. Incredible home cooked meals are served communal style in the dining room with its roaring wood fire. It's a great chance to mingle with other guests and enjoy the heartfelt hospitality. On the night we stayed we enjoyed a cheese platter, hearty lamb shanks and rich chocolate mousse. Breakfast is self-serve and may include muesli, toast, plunger coffee, tea and the best farm eggs you're likely to find this side of the Tasman. A TripAdvisor reviewer describes the glamping tents as "more like luxury hotel rooms with canvas walls" and it's an apt summation. 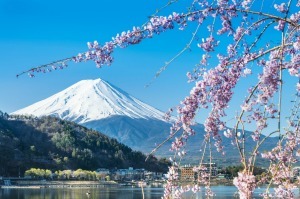 Additionally, expect lashings of warm, country hospitality, terrific food and extraordinary views. Waking up to phenomenal views and the Tyrrells' warm hospitality. Being on the South Island of New Zealand, the tents can get chilly at night but the beds are toasty warm. Gumboots would be a useful thing to pack. Sheriden Rhodes was a guest of Tourism New Zealand.